The art of construction in bricks is called brick masonry; Bricks are laid with cement mortar or lime mortar. In ordinary and inferior quality of works, mud mortar is also used. Brick masonry laid with cement mortar is stronger and more durable than that laid, with lime mortar. But lime mortar is very commonly used due to its low cost. Bricks are made in a range of varieties, each intended for a specific purpose, but all are created from some combination of sand, water, clay, and heat. Building brick, or common brick, is used in construction and is often “cored” with two rows of holes to save material and reduce weight. Face brick is chosen for visible surfaces or exposed walls and comes in different colors, sizes, and shapes. Firebrick is made with special clay to offer additional heat resistance in fireplaces or boiler rooms. Glazed brick is coated on one surface with a ceramic finish that is sanitary and easy to clean, making it popular in hospitals and laboratories. 1. The bricks should be properly soaked in water, before they are used. 2. The bricks should be so laid that their frogs face upwards. 3. Mortar used should be as stiff as possible. 4. The vertical joints of alternate courses should be in one line. 5. The walls should be raised uniformly and vertically of the wall should be tested at every course. 6. All the joints should be of equal thickness and the ‘thickness of each should not exceed 0.5 to 1 cm. 7. In one day not more than 1.5 m of wall in height should be constructed. 8. If the full length of the wall is not approachable, then raking back must be provided as shown in Fig. 9. The work should be kept wet from 4 to 7 days until the mortar sets and becomes hard. 10. 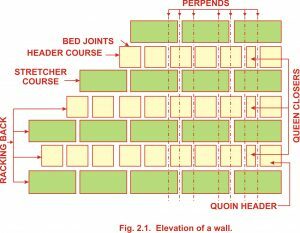 When a main wall is to be connected to a cross wall, recesses, called too – things should be left in alternate courses to allow the two walls to be bonded with each other, as shown in Fig.